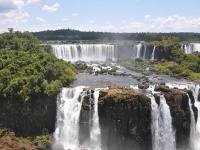 The Rio Iguaçu begins its journey in the coastal mountains of Paraná and Santa Catarina, snaking west for 370 miles (600km) before it widens majestically, plunging and crashing through the jungle in tiered falls at the border with Argentina and Paraguay. The Foz do Iguaçu (Iguaçu Falls) are more than two miles (3km) wide and 262ft (80m) high (almost twice the height of Niagara Falls), and their beauty is unmatched. Their name, fittingly, comes from the Guarani Indian word meaning 'great waters'. The deep flowing waters of the river tumble down 275 falls, the most famous of which is Devil's Throat on the Argentinian border, with a drop of 230ft (70m). As well as taking in the stunning views, visitors can enjoy kayaking and other water sports in the river. The best time of year to visit is August to November, when there is least risk of floodwaters hindering the approach to the boardwalks. The falls are surrounded by the Iguaçu National Park, a huge sub-tropical rainforest covering 135,000 acres that is home to thousands of different species of animals and birds including parrots and hummingbirds.